The superficial plot design of Finding Nemo likely spawned from road comedy staples from the days of Bob Hope and Bing Crosby, but the journey beneath the sea hearkens to a more recent, much heavier entry in the genre: Rain Man. When the uptight straight man Marlin (Albert Brooks) takes up begrudgingly with flighty loner Dory (Ellen DeGeneres) on a globetrotting quest to find his lost son, we’re transported to the cross country trek of Charlie and Raymond Babbitt (Tom Cruise and Dustin Hoffman) in Barry Levenson’s Oscar-winning picture. Self-serving Charlie teamed up with his estranged brother Ray, an autistic savant, not out of compassion or fraternity but to further his own conquest for his father’s inheritance. Along the way, Ray’s disability provides a number of hurdles (he can’t board an airplane, can’t go outside when it rains, can’t be touched) and opportunities (his knack for quick counting does the boys quite a few favors at the blackjack table) alike for Charlie as their travels take them to strange places (backwoods motels, doctors offices, Vegas casinos) and situations ranging from comical to emotionally resonant. With Marlin and Dory, it’s the same song: Marlin monopolizes on Dory’s unique ability to read human English (and speak a bit of whale, as she’ll proudly boast) as they traverse the realms of sharks, jellyfish, sea turtles, and a school of John Ratzenberger, bounding from moments of laughter and tears all the while. But beyond the surface value similarities, the relationship between Marlin and Dory is reminiscent of that of the Babbitt brothers. 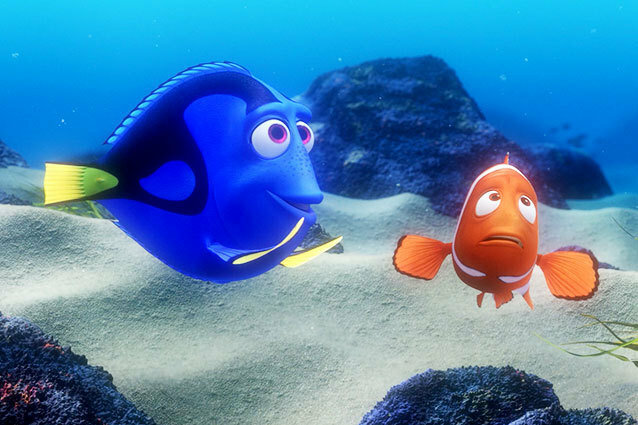 Impatient Marlin is at his wits’ end with Dory’s demanding mental state. The biggest hurdle along the way for the duo is Dory’s short-term memory loss, not a mere character quirk in Finding Nemo but a bona fide disorder that prevents her from living independently (when left alone by Marlin towards the end of the film, Dory’s anxieties kick up and overtake her memory altogether, leading her to forget the entire mission she and her fair-weather had just braved). Alongside a forgiving and accepting Marlin, Dory’s traumas are assauged and her memories bolstered. But we don’t imagine that Finding Dory will do away completely with the trait that defined DeGeneres’ fan favorite character in the first movie. What they should do, instead, is really tackle the issue, diving headfirst into a multifaceted, emotional and intellectual story about living with (and living with someone living with) mental disability. Sounds like a silly venture for a Pixar movie, maybe, but just think of the Toy Story franchise: a trilogy that expanded from “What if toys came alive when we left the room?” to a heartrending allegory about self-preservation, loss, and identity. Finding Dory has an opportunity to build upon the simplistic ideas that made Nemo a charming one-off feature — to make the characters worthwhile in further episodes, we’ll have to see a deeper exploration of what makes them tick. 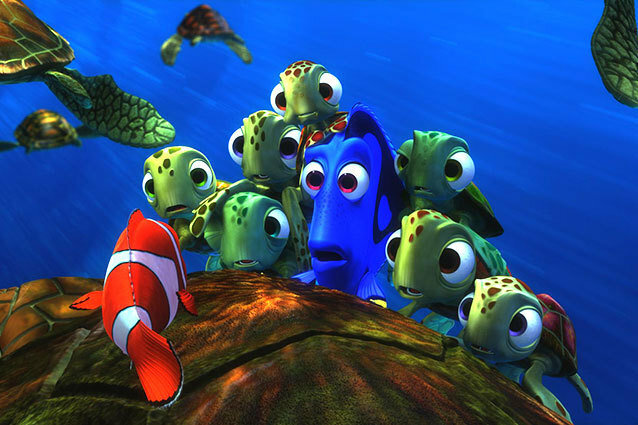 Marlin is plagued with insecurity, Nemo with a physical disability, and Dory (who, as the title would indicate, is the focal character in the new movie) with a mental disability. And this disability deserves an intricate center stage treatment. As mental impairment is a subject matter that Hollywood has tackled time and time again, Finding Dory can learn from the example of past greats. Beyond Rain Man, we have a number of other public and critical favorites that can provide example of moving and insightful ways to depict the journey of a mental disability sufferer. A constant among many of these films is the director’s drive to shatter society’s expectations of the spotlit figures — nobody believed much in Forrest Gump‘s titular hero at the beginning of the movie, but Tom Hanks‘ most memorable cinematic character went on to take part in, if not institute, just about every great event in American history. Ditto Radio, on a much smaller scale: Cuba Gooding, Jr. portrayed a mentally disabled young man whose spirit brought a small town football team to unity and grandieur. Dory’s limitations did not keep her from achieving victory in Nemo, but then again we didn’t see the extent to which they anchor her down. Following in the footsteps of uplifting sagas like Forrest Gump and Radio, Finding Dory might look to chronicle the wowing capabilities of memory-loss victims in the same way: perhaps her indomitable zest for life will outweigh her handicap in the sequel’s story, branding Dory with the sort of embrace of self-worth advertised by Hanks’ and Gooding’s pictures. There are, of course, much less “whimsical” accounts of mental disability in recent cinema: the 2001 movie I Am Sam might have endeared viewers to Sean Penn‘s character and invited them to truly understand the complexities of his condition in an unprecedented way, the film didn’t offer the fairy tale ending many might have expected, or hoped for. It might unlikely for Finding Dory to bear to the wills of bleaker realism, but not implausible. Toy Story 3, Up, and Wall-E rank as three incredibly heavy, often dark, movies. In this vein — and borrowing from the attitudes of I Am Sam, of Rain Man, of the “Flowers for Algernon” film adaptation Charly — we might look for a Finding Dory that actually sets standing limitations on Dory. She will never be able to live on her own or even remember things prior to the present hour, it’s a somber state of affairs. Perhaps for a character so enamored, a story this real is what fans deserve? We have no idea just yet what Finding Dory has in store. Maybe we’ll just find ourselves in another seafaring journey filled with laughs and whimpsers. But maybe we’ll see a real examination of the internal struggle of DeGeneres’ character — that’s how the movie can truly work wonders; Pixar does best when Pixar dives deepest.